Star has been here now for two months. It seems like she just arrived in some ways, but the pasture is mostly eaten and the dry weather has limited the new grass that’s available. She’s very happy eating her hay. Star’s past is largely a mystery. 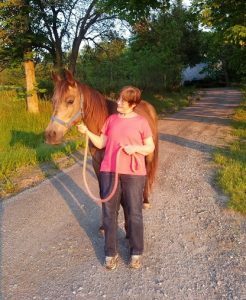 She was brought here from Maryland by my neighbor’s sister, Krista, who already owns 15 horses and managed to rescue Star out of a neglectful situation that she was in. 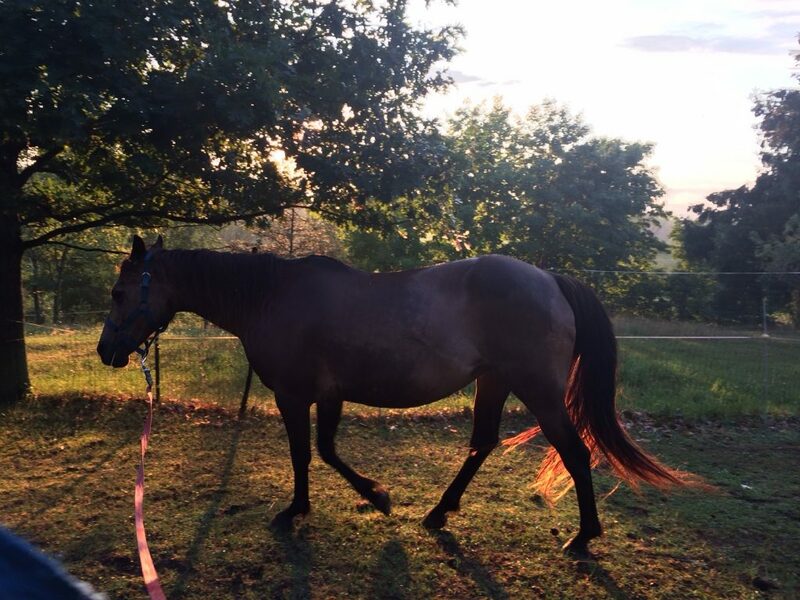 Star had also had a foal a year ago before Krista rescued her. Little is known about Star before this time, except that she had been purchased at an auction before Krista stepped in to bring her a better home. But some things are certain. Parts of her life were not so pleasant. 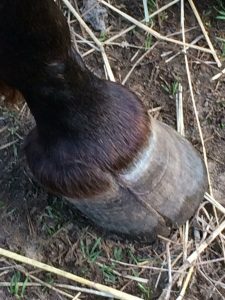 You can see from her hoof that she had a severe injury at one time which actually has affected the whole pattern of growth in that hoof. Getting her treated and prepared to recover from it has to have been a very traumatic experience. I think some of her memories are very fearful. 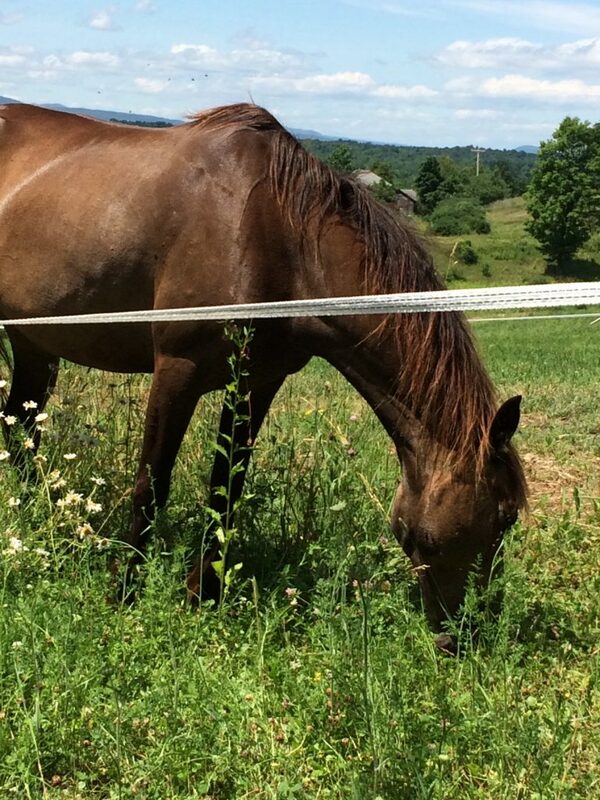 She is a gentle mare and wants to please, but frightened by many things. She can be frightened by new people. She can be frightened by certain actions that a person may take around her. It took weeks before I could brush her down her legs. She would let out a squeal and stamp her feet if I started to brush down her legs. At first she also wouldn’t want me to pick up her feet. She liked to be brushed but didn’t really want someone touching her head very much. She has since learned that having her face brushed is a really nice thing, and now often closes her eyes when I brush her face. She did not want her ears to be touched and now after brushing her for a little while I can brush her ears too. She really didn’t want a bridle to go over her ears. The first time I tried to put a bridle on the way I always have put a bridle on a horse thousands of times, she reared and flipped me to the other side of the shed. A different approach had to be taken. I have tried a bitless bridle and Star is learning to respond to it. Also, trying to put the bridle on ahead and then attach the bit afterwards, that way the bridle is placed on her head and doesn’t have to fold her ears as it is pulled back over her head. 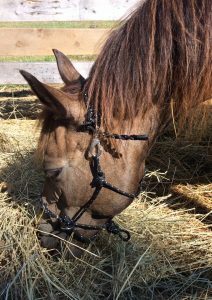 She really does seem to work the best with a bit in her mouth, a very simple snaffle bit, so I am not giving up on the bridle, but the bitless bridle gives me a simple approach to get ready for doing riding while I’m waiting to get the bit accepted. I have also been looking for a saddle that will work with both Star and I a little bit better than ones I have tried, and I’m being very cautious about buying a new one until I know what works. Lots of saddles can be found very inexpensively, but if you read the reviews, you get what you pay for. It seems a used saddle could be the best investment. I am trying now a used cut back flat saddle that I think will not propel me forward over her neck, as several of the saddles I’ve tried have done. So my relationship with Star is progressing. I spend good amounts of time brushing her and then lunging her and having her follow simple commands of walk, trot, walk, and whoa. Whoa being probably the most important one, as if a horse will respond to that, it can help out in an emergency situation. Lunging is a horse circling about the handler on a long line and exercising her at different gaits such as walk, trot, canter and stop. Lunging also serves to help the horse work at a slight curve in its body in both directions and serves a benefit to the horse similar to doing yoga or Tai Chi. With my neighbor Monika, whose sister gave me star, we have taken walks up into the woods and I have ridden while Monika walked up into the woodlands, giving Star new places to see and all of us enjoying the new sights and trails in the woods. This is something I really enjoyed with my other horses. I did used to show several of my horses and did very well, but nothing could compare to going off on trails and discovering new land and sights. It was good for the horses and good for me, and they seemed to enjoy the change of scenery. I admire that you are considering Star’s past experiences and personality as you carefully nurture a trusting relationship out of the saddle, with hopes that trust will carry over in the saddle on the trails. It certainly seems like Star’s wishes have come true in finding a home with you and I hope that you are able to share your dreams with Star enjoying many safe and memorable trail rides together. Thank you so much Nora. Yes she is a special girl and I am moving slowly with her. I have a bitless bridle she likes and we are learning to connect. I did get to ride the trails last week with her. It is a joy to ride again but most of life with horses is to care for and enjoy their presence. ( speaking for myself) Glad you read my blog too. Have a good summer.